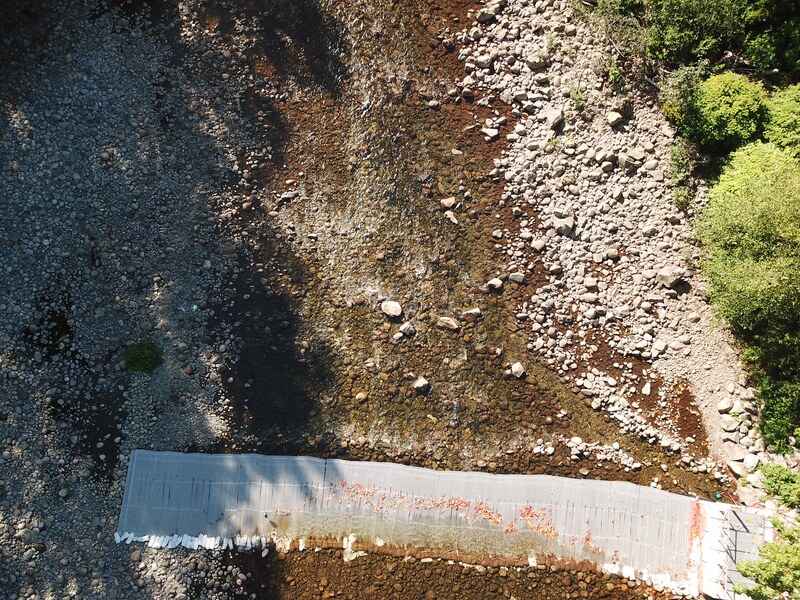 As the Society and it’s partners deal with the rock slide on the river, a temporary fish fence has been built. The fence was installed in an attempt to intercept fish migrating upstream. Prior to the fence many fish were migrating to the slide and injuring themselves trying to pass the barrier. Steelhead with head injuries from repeatedly trying to jump through the rockslide. Thousands of staff and volunteer hours were spent attempting to net the stranded fish and move them past the rockslide debris. This level of volunteer commitment and labour was unsustainable. The tangle netting and seining was hard on the fish and it was not an effective short term solution. In 2015 fundraising began to allow the Society to build a fish fence. Once funds were secured from Pacific Salmon Foundation and Fisheries and Oceans Canada, construction began. The floating fish fence, the largest in BC, began fishing in August of 2016. The fence is only operational when the river is at low to medium water levels. In high flow events the design allows for water and debris to go over top of the fence. It is a design strategy that enables the fence to remain in the river year round while sustaining minimal damage during months when water levels are very high. When water levels permit, fish can only bypass the fence by entering into the large live box with a one-way door. The top of the box can be easily opened by staff. Staff can then net the fish from the trap to a waiting trailer and move them up, beyond the rockslide with minimal stress. In 2016, from August 6th when the fence began catching fish to the first week of October when water levels rose too high for the fence to be a barrier, 485 fish where trapped. 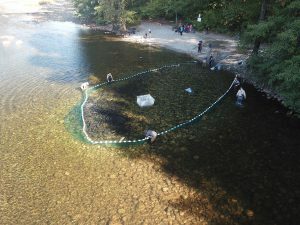 Of the 485 fish, 337 were moved to the upper river, upstream of the slide, to spawn naturally and the remainder were taken to the hatchery to be used as broodstock. A percentage of those fish were held at the hatchery as broodstock, while the majority were released in the upper river to spawn naturally.